Scopes which feature long eye relief, sometimes called extended eye relief or abbreviated EER for short, can be a great option for several different types of firearms. Your average scope typically offers anywhere from 2 to 4 inches of eye relief, this is the distance from your eye to the eyepiece on the scope. For some high-powered rounds and older guns not designed for modern scopes, this can pose a problem with high recoil. Scopes with long eye relief, which is typically defined as providing at least 6 inches, but sometimes much higher, give you the comfort and security of keeping your head further away from the gun when firing. There are several models to choose from, but here is a short list of the best long eye relief scopes. To specifically talk about eye relief, we have to properly define it. Eye relief is the precise distance your eye must be from the scope’s rear lens to see a full target picture. You can have some wiggle room, but typically with the eye relief on your average scope, it’s about 3 and ½ inches away. It may be more or less as your zoom level changes. Higher magnification requires your eye to be closer to the rear lens, possibly down to no more than 2 inches. Lower magnification lets you drift further away to the upper range of what is allowed by your scope. Long eye relief scopes are designed with special lenses and eyepieces that allow you to stay further away from the lens but still get the benefit of higher magnification with limited vignetting. Field of view is another spec on most scopes that sometimes goes overlooked along with eye relief. However, the two go hand-in-hand when it comes to overall usability, especially as magnification increases. Consider, for example, that you’re shopping for a long eye relief scope but also require a certain field of view at a higher magnification. This is notable because the magnification level usually causes the eye relief distance to change. A scope that meets your needs for a certain eye relief distance at a certain magnification may not meet your needs as the magnification increases. As the magnification increases, the field of view and eye relief decreases. If your gun requires a certain distance of eye relief for safe shooting, and you also require a certain field of view, you’ll want to take note of these numbers and understand that magnification can adversely affect them. Long eye relief scopes can be more sensitive to field of view and magnification changes than a scope with traditional eye relief. We’ve mentioned high-powered rifle rounds or shotguns that need reasonable eye relief to keep your head at a safe distance, but handguns are another application for long eye relief. In this case, long eye relief allows you to hold a handgun at a normal distance from your eye and still use a scope to find your target. At upwards of 20+ inches away from your eye, you won’t get high magnification at this distance, but you will be able to use a scope on your handgun. One application for a long eye relief scope on a handgun is hunting. In many jurisdictions, it’s possible to use a handgun, chambered in a powerful round like a .44 Magnum, to hunt big game. You’re not going to get the distance of a rifle, of course, but some hunters enjoy hunting with a handgun and if you add a scope, you’ll need one with extremely long eye relief. While it may offer comfort and extend the usability of some firearms, having a long eye relief scope does not come without sacrifices. Reduced Light Transmission – Most scopes with shorter eye relief, of around 3 and ½ inches, will offer better light transmission than scopes with long eye relief. This is due to the nature optics and the fact that having your eye further away from the rear lens simply does not allow as much light transmission as having your eye closer. Some scope models and manufacturers try to improve the light transmission with highly reflective coatings or exclusive designs. This is something you’ll want to be aware of when shopping for a long eye relief scope. Reduced Magnification – The combination of long eye relief and high magnification does not mix well for most scopes. It is simply near impossible to have a clear image with high magnification and still allow for long eye relief. Most long eye relief scopes will top out at around 8 to 9x magnification. This is because as the zoom level is increased, there is a greater requirement for higher light transmission through the scope. As we noted above, long eye relief scopes are already limited with light transmission. This means that when you’re shopping for longer eye relief, one trade-off will be the ceiling of magnification you can find on a long eye relief scope. Sure, there are drawbacks, but there are also tremendous benefits of long eye relief. Faster Target Acquisition – The goal of a long eye relief scope, aside from safety and comfort, is to draw your target quicker and fire off a shot without the need to spend time getting your eye at just the right distance. This can be true for hunting and for tactical situations as well. Easier to Use – With a long eye relief scope, you can much more easily get a full, clear image of your target without practically sticking your eye inside the scope. This makes for a more enjoyable experience and allows for more awareness of your surroundings. Now that you understand the basics of what a long eye relief scope is and is not, let’s get on with the product reviews. Here are five great options to look at when searching for the best long eye relief scope. Leupold offers some excellent scopes, and the VX-3i model stands up well in their product line. While the eye relief is not among the longest in the field, maxing out at 4.4 inches, it still passes muster for a long eye relief option. The trade-off for the 4.4-inch eye relief is getting a scope with 14x magnification with this spec. As noted above, most long eye relief scopes max out around 9x, but the VX-3i rises to 14x. This is a scope that offers more magnification at the expense of eye relief. As with most Leupold scopes, the lenses are treated with the exclusive Diamondcoat 2 coating which provides superior light transmission and better abrasion resistance. It also goes above and beyond the industry-standard nitrogen filled body and upgrades to the Leupold proprietary blend of argon and krypton gas to practically eliminate fogging and provide great weatherproofing in all environments. What you’re getting with this scope is extremely high-quality lenses for the best image quality possible. The Leupold name is synonymous with quality, and this model goes beyond most competitors when it comes to clarity and definition. Users report that the adjustment turrets are extremely smooth and the image is “crystal clear,” which is a great selling point for a scope that commands a premium price. The Nikon Force XR is a scope specifically built for handguns rather than rifles. It is designed with Nikon’s exceptional quality and the manufacturer claims it has been tested to hold up against even the most extreme recoils, including the legendary S&W 500 hand-cannon. Featuring Nikon’s ultra clear coat optical system, which provides up to 95 percent light transmission, this lens is a great option when searching for long eye relief. This scope features eye relief of between 9 and 11 inches which is generous compared to most. Some users, however, report that it’s usable up to 12 inches depending on magnification level. The only drawback is low-light situations which make the longer eye relief somewhat unusable. Some users will appreciate Nikon’s BDC reticle, which makes accounting for elevation a breeze when looking through the eyepiece. It is also O-ring sealed and nitrogen purged for fog-resistance and weatherproofing. Generally, users report a great image quality, but that can vary depending on the distance from the rear lens. At high distances, taking advantage of the generous eye relief, there can be some limitations on getting the full target picture. The 2-7x32 Crossfire II Scout riflescope is perfect for use on your scout rifle. The V-Plex reticle is a popular all-purpose hunting reticle intended for a wide variety of hunting applications. With 9.45" of eye relief and an ultra-forgiving eye box, you'll be able to quickly get a sight picture and acquire your target. The fast focus eyepiece allows quick and easy reticle focusing. Vortex started as a small outdoor retail store in Wisconsin which grew and evolved to eventually become Vortex Optics in 2002. 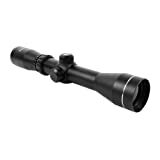 Vortex makes top-quality scopes at reasonable price points and the Crossfire II fits nicely in this list of the best long eye relief scopes. Maxing out around 9 and ½ inches in eye relief, this option will fit well on any rifle or shotgun and provide a generous level of eye relief. It also features the Vortex V-Plex reticle which is a thin, easy to see reticle intended for multiple uses. Also worth noting is that this is a 2nd focal plane scope which means the reticle will stay the same size in the eyepiece regardless of target distance. This scope is light, too, coming in at just 12 ounces so it won’t add much to your gun in terms of extra weight. The magnification is limited to 7x maximum zoom, but that is to be expected on a scope with over 9 inches in eye relief. To counteract poor light transmission, Vortex has coated all air-to-glass surfaces with multiple anti-reflective coatings for the best image clarity possible. It is also O-ring sealed for weatherproofing and nitrogen-purged for antifogging. One nice feature is that the turrets can be re-index to zero after the rifle is sighted in. This makes future adjustments easier and keeps the adjustments very intuitive. UTG, which is a brand made by Leapers, has been around since 1992 making quality and affordable rifle scopes. This model, which offers up to 7x magnification, sits on the higher end for eye relief at a maximum of 11 inches. There are many nice features on this scope that you wouldn’t ordinarily expect at this price point. All the lenses have received the Emerald Coating which is intended to increase light transmission and clarity. Furthermore, it comes with a 6 Mil-dot tactical range estimating reticle which offers great performance for on-the-fly accounting of wind and elevation without adjusting the scope. It also features a built-in angled sunshade to help on bright days. If that list wasn’t enough, the reticle is also illuminated with 36 dual-color mode options to account for all weather and light conditions. Some users may find this gimmicky to go much beyond the standard red or green option, but it’s a feature you don’t find on other scopes at this price point. In essence, you can customize the reticle color to anything of your choosing within the 36 color options. Users also report that the reticle works just fine without illumination if that feature doesn’t interest you. The reticle is a clearly defined black when illumination is not in use. Aim Sports has some great products and a price range that will suit even the smallest budget. This option, form their Scout Series, features an eye relief measurement of up to 10 and ½ inches which fits the bill for most any need. It is fog-proof and shock-proof, made with weather resistant seals and a nitrogen-purged interior. The lenses are Green fused and multi-coated to provide better light transmission, clarity and scratch resistance. Weaver and Picatinny ring mounts are also included with this model which will save you a little more money since some manufacturers don’t include them. Featuring 7x magnification, users report that it performs well mounted on an AR-15 but can be versatile for a number of guns. Users also report that the eye relief functions well and provides for comfort at various zoom levels while still providing a clear picture. Despite the lower price point, Aim Sports products still come with a lifetime warranty and users report that they do go the distance over years of use. How does longer eye relief function in low light? – Scope manufacturers do the best they can to deal with low-light and low-visibility situations. With a long eye relief scope, this challenge is increased because moving your eye further away inherently reduces the light transmission. In short, you shouldn’t expect the same light transmission on a long eye relief scope that you’ll get from a standard scope. What does “Max” eye relief mean? – This is basically the manufacturers claim of how far away you can have your eye from the rear lens and still get a quality image. This distance may vary some, you may be able to move back a couple more inches, but not much, and it all depends on the level of light in your surroundings. Staying within the max value is the way to get the best performance according to the manufacturer. Where does long eye relief fall short? – You won’t be shooting long range with long eye relief if that makes sense. Many of these scopes have the name “Scout” in the title which refers to the ability to shoot on the move. Unless you need long-range accuracy, which means you’ll be limited to shorter eye relief, a long eye relief scope is good for most any situation outside this requirement. But if you’re in need of a scope capable of shooting long range here’s a good long range scope on a budget. Long eye relief scopes are versatile and can be installed and usable on many different guns in many different calibers. They don’t come without drawbacks, of course, like a lower magnification level, but they’re usable in more situations. Hopefully, this guide has given you the tools necessary to find the best long eye relief scope for your particular need. There are plenty of good options to choose from and most major brands have a long eye relief scope in their product lineup. You’ll be in good shape with any of the models listed above as a great starting point.